We, at Pets World, care for the health and well-being of your pet and hence include in our collection all kinds of food products which are best suited for your dog. In the furtherance of this noble pursuit, we bring to you food products from the brand of Chappi. This is one of the most iconic brands of dog food present in the market which has been around for some time. The food products by Chappi are made of natural ingredients and no artificial preservatives or genetically modified ingredients are used in their manufacture. They constitute a perfect blend of nutritional content like fiber, protein, carbohydrate, fat, calcium, phosphorus, sodium, etc., to provide the best care to your dog. Apart from this their taste is exceptional and they are a treat for your dog’s palate. 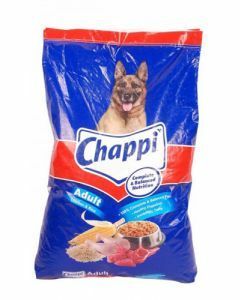 At Pets World, you can find Chappi Adult Dog Food which is suitable for dogs of all sizes, be they giant, maxi, medium or mini. This dog food is also suitable for all breeds of dogs including Beagle, Rottweiler, Saint Bernard, Shih-Tzu, Chow Chow, Collie, Dachshund, Dalmatian, Labrador Retriever, French Bulldog, Maltese, Pomeranian, Pekingese, Pug, Poodle and many more. Chappi is a complete and balanced food for providing the necessary nutrition to your beloved dog. It has a steady balance of low fat and necessary dietary fiber, which helps in healthy digestion and makes this product best for dogs who are unable to digest food easily. It also has fatty acids which make the fur of your precious dog shiny and soft. The size and form of the kibbles also ensures good dental health for your dog. At Pets World this product is available at easy availability to all its customers at a very reasonable price.